The Lincoln Court Senior Apartment complex is an affordable place for seniors to call home. Self-Help for the Elderly’s mission is to provide seniors with high quality housing and services and ensure their safety without taking away their independence. The new 3 story, 82-unit complex provides a place for seniors to live independently with the benefit of senior care. The apartment includes studio and one bedroom units and include a community room, on-site laundry, parking, courtyard, computer learning center, library, and supportive services. The apartment is also designed with sustainable technologies, including solar energy panels, green materials, and energy conservation features. 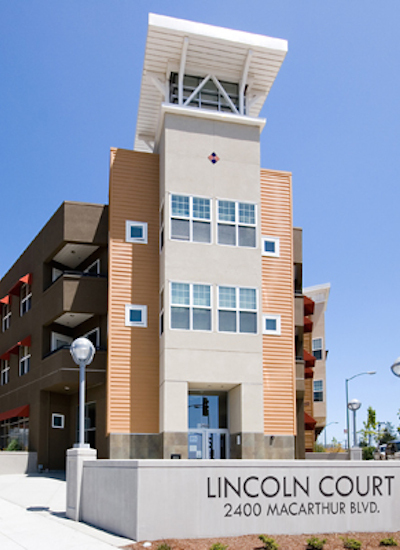 The apartment is financed by the City of Oakland Community & Economic Development, the Redevelopment Agency of the City of Oakland, the State of California Department of Housing and Community Development and U.S. Bank National Association. The Lincoln Court Senior Apartments provide a community for seniors to engage and socialize with each other. It ensures that they will not be lonely or isolated, since there are many scheduled activities for the residents to be involved in. The location also gives them access to close shopping, medical offices, and restaurants. This independent living program promotes independence and sociability within the residents. Give us a call today to learn more about Self-Help for the Elderly’s mission and the Lady Shaw Senior Housing program!